TBP (New Delhi, India) – Stakes are high and so are the expectations – claims are big and so is the confusion – changing the world economic order is a daunting task and the leaders trying to attempt that are the heads of state of the five BRICS countries. The man at the centre of the debate is Indian prime minister Manmohan Singh – who was the chair till today and will hand over the mantle to the South African President Jacob Zuma tomorrow. Singh is often described as the Guru of Economics – he spearheaded the Indian growth story as the Indian finance minister in 1992. He initiated a slew of economic reforms which made India climb from “poor” to “developing” country. He is one of the key thought leaders who is driving the BRICS agenda today. The Indian prime minister was given a red carpet welcome at the King Shaka International Airport in Durban. He was received by South Africa’s minister for justice and constitutional development Jeffrey Thamsanqa Radebe. “I am delighted to be in South Africa once again. This visit is for the BRICS Summit. 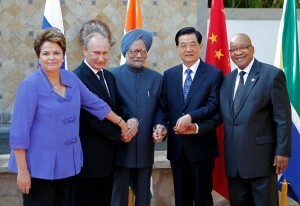 BRICS is a new grouping, young with a lot of promise,” Singh told reporters. The BRICS development bank which is the most likely and definitive outcome of deliberations till now has the backing of Singh. He made a strong pitch for this during the 2012 New Delhi Summit. Since then, despite huge challenges the grouping has travelled quite a distance and the BRICS bank is all set to be launched tomorrow. BRICS countries have been asking for greater representation at existing economic institutions like the IMF and WTO. “India will urge faster movement on reform of institutions of global political and economic governance,” Singh said, outlining concerns that India will raise at tomorrow’s meet. The BRICS contribution to global growth in 2012 was four per cent while that of the powerful G7 was 0.7 per cent. He talked about “ensuring macro economic stability and finding mechanisms and measures to promote investment in infrastructure and sustainable development”. This is what the BRICS Bank is slated to achieve with its formation as well. The prime minister who is travelling with his finance and commerce minster, beside a big business delegation, is likely to push for stronger focus on ‘developments affecting global peace and security’. Sources close to the South Block (prime minister’s office) are claiming that India will make a big push for intra-brics trade and commerce and also for alternative ways of using the ‘surplus capital of the world’.